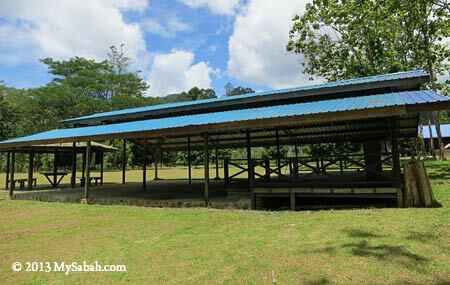 Personally, I think Taliwas Forestry & Recreation Area (or Taliwas Park) in Lahad Datu is the Best Camping Site in Sabah. 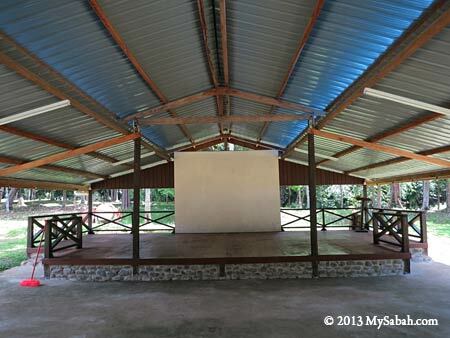 Whether you like rainforest, river, waterfall or lake, Taliwas Park has all these. 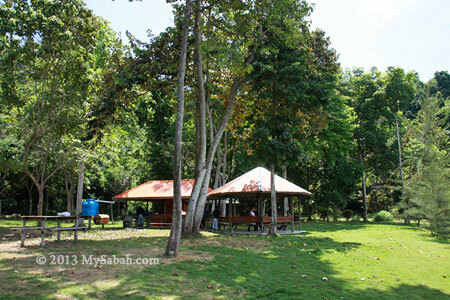 The park is also very well-managed (by Yayasan Sabah Foundation) and camper-friendly. However, Taliwas Park is not commercialized, so very few hear about it. Actually I learnt about Taliwas Park by accident, when I was cycling there last year. Last year I went to Taliwas Park for a cycling trip. I did a few photo-shooting near the camping ground, because the rainforest there looked so fresh and lively under the morning rays. 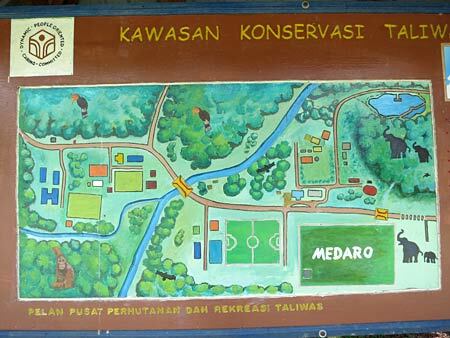 Taliwas Park itself is a fully-protected forest reserve. Pic: check out the tall and dense trees above our heads! 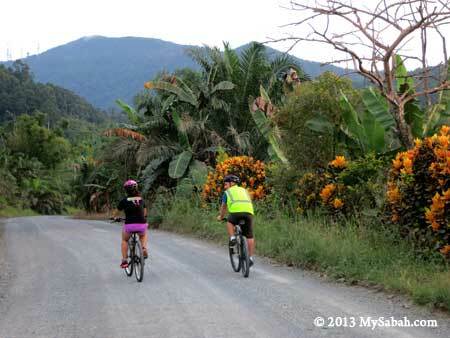 We followed a gravel trail from the campsite of Taliwas. 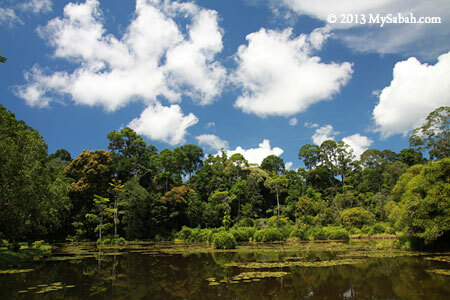 In about 300 Meters, we arrived an open space and Pandan Lake was just in front of us. 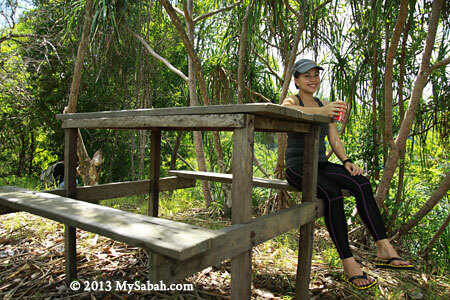 I was so excited about the scenery (really, because there aren’t many nature lakes in Sabah). 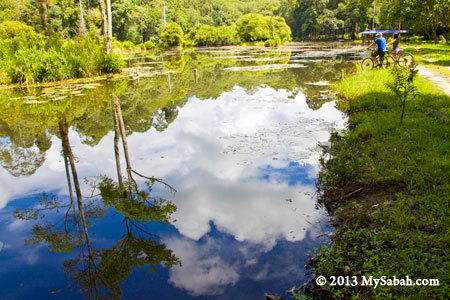 The weather was perfect, I love the reflection of lush trees and blue sky in the lake, so I took a lot of pictures. 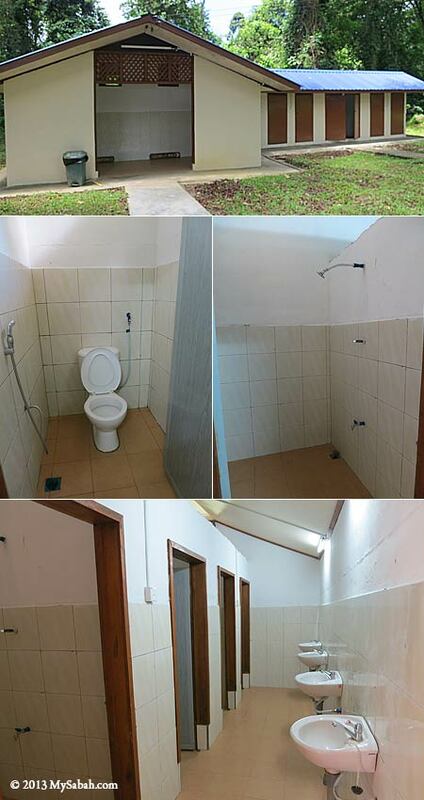 You can click the photos to enlarge them. 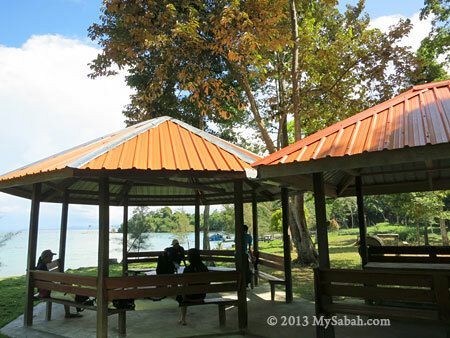 Pandan Lake is a great place for picnic. 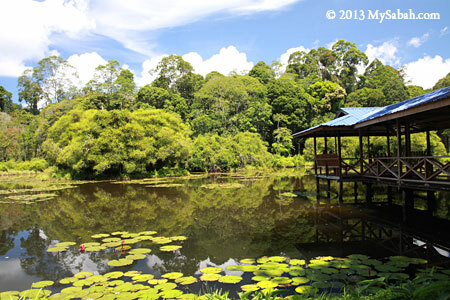 Visitors also come here for bird watching, wildlife sighting and kayaking. 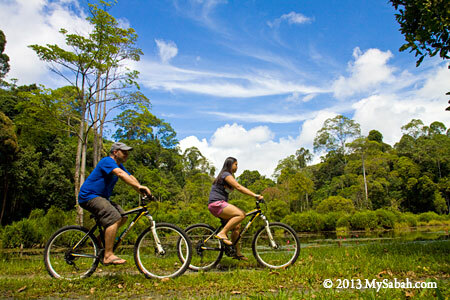 My “discovery” of Taliwas Park was started with a cycling tour with Bike and Tours in Lahad Datu. 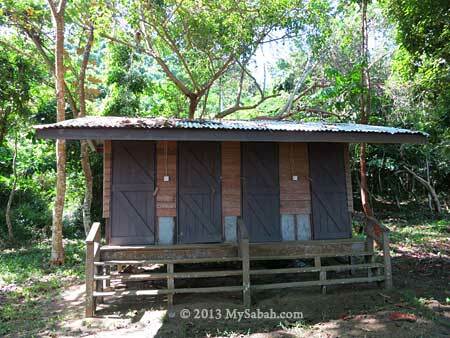 We started at Silam junction which led to a long gravel road flanked by dense wood, oil palm plantation and village houses. 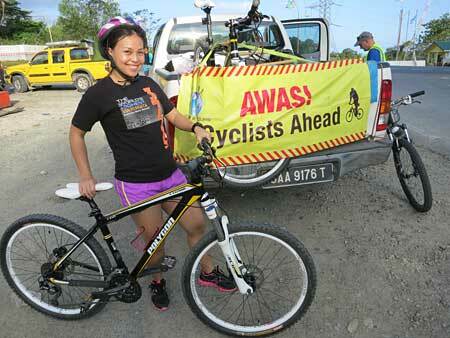 For safety, a 4WD will accompany the cyclists. This area is very near to the forest reserves. If you are lucky, you would see herd of Bornean pygmy elephants on the road. The cycling distance was about 20 KM and we stopped at Taliwas Park for a dinner. 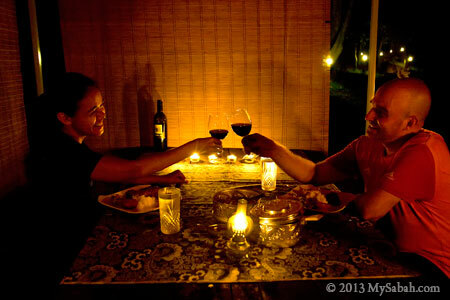 Then you can enjoy a candle light dinner next to the river of Taliwas. There is no restaurant in the park, so Simon and Tisha (from Bike and Tours) prepared the food and setup the table for us. They made some BBQ seafood, mashed potato and chicken wings, which were really delicious. 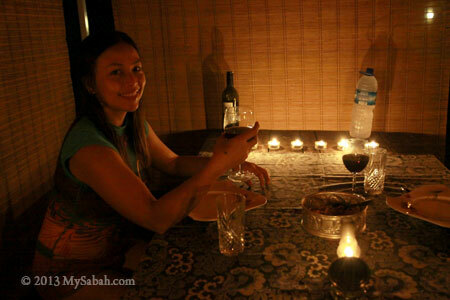 It’s a very creative way of dining for honeymooners lol. 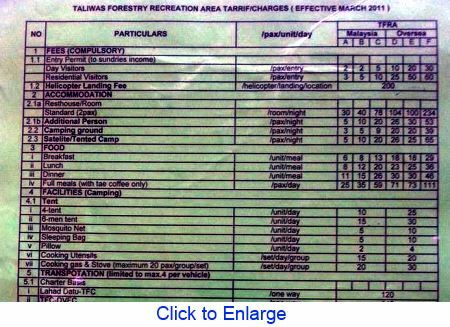 Ok, let’s see more about Taliwas Forestry & Recreation Area (Taliwas Park), so you know why it is an excellent camping site. 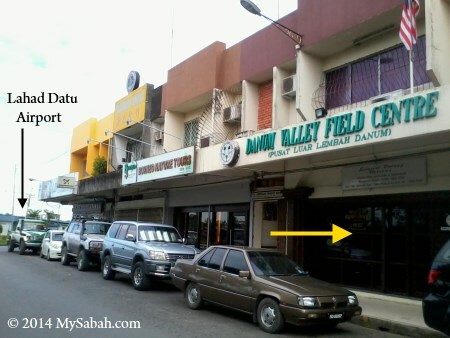 Taliwas Park is 39 KM away from Lahad Datu town (see Location Map). 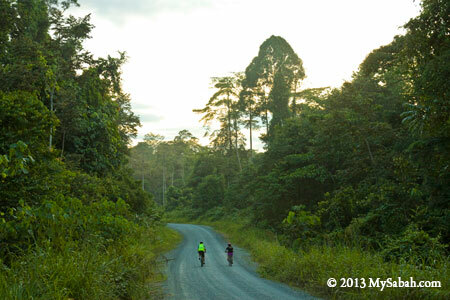 The road 20 KM before Taliwas Park is unsealed and can be muddy in wet season, so you better go there by 4-Wheel Drive (or by cycling like what I did). The park has water and electricity supply. 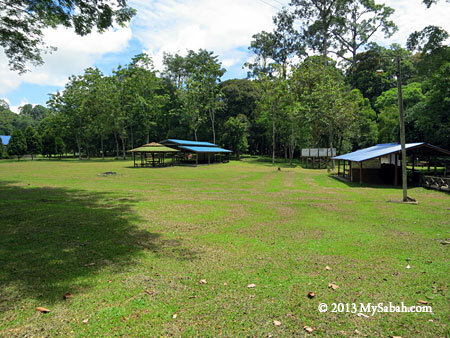 Pic: the camping ground of Taliwas Forestry & Recreation Area is vast and can accommodate hundred of campers. 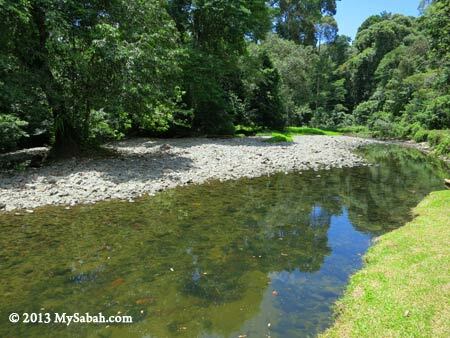 Pic: the river in Taliwas Park is shallow and clean, very suitable for a swim. 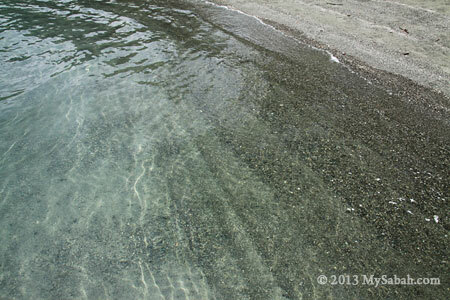 The water is so clear that I can see many big fishes swimming. Sorry, we are not allowed to catch them. 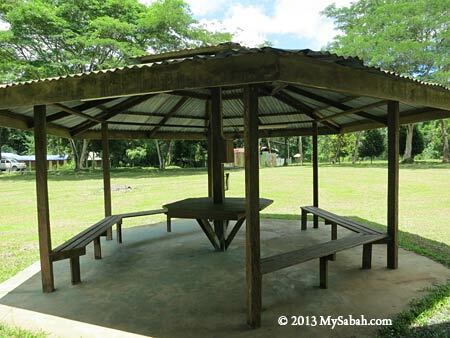 Pic: the activity area, where group of campers can gather here to do some activities. 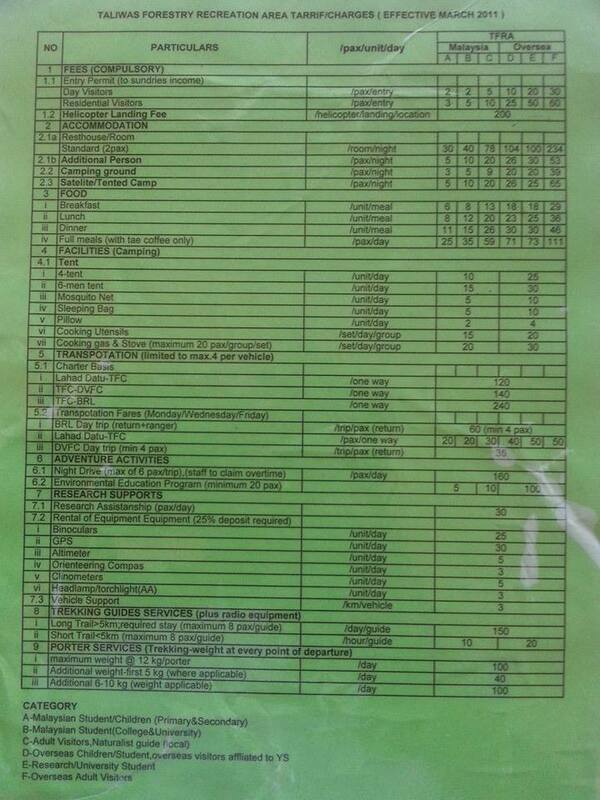 Pic: above is the layout map of Taliwas Park, you can click it to enlarge. If you like waterfall, you can trek an hour in a jungle trail to reach there. Someone posted some nice photos of camping and Taliwas Waterfall, which I don’t have. 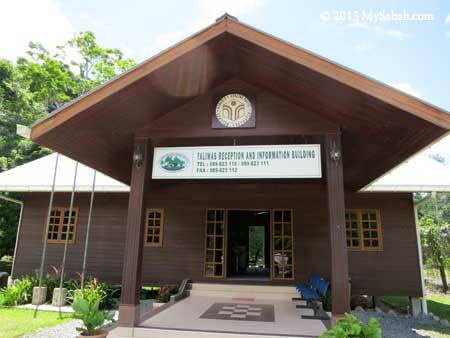 Pic: Reception and Information Building at Taliwas Park. You must check-in here before you enter the campsite. For booking and enquiry, please call them at +60 89-880825 / +60 89-823110 / +60 89-823111, or e-mail to Ms Fevayati Jimang (feva_fj@yahoo.com) / Ms Zalilah Ali (alizalilah@yahoo.com). 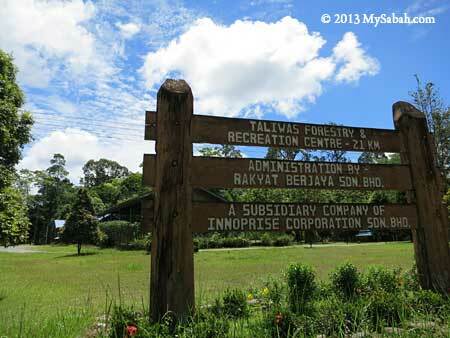 Taliwas Forestry & Recreation Area has a Facebook page too if you want to in touch with them online. 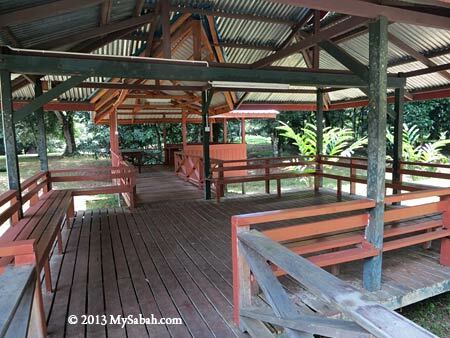 Please note Malaysia school holiday is the peak season for schools and nature clubs to organise holiday camp or educational tours in Taliwas Park. The park can be crowded and noisy during that period. Anyway, the park is quite empty in other times. Above is the list of services and charges (fee in Malaysian currency (RM), RM1 ≈ USD$0.33) I copied from their Facebook page, quite exhaustive. They really know what campers need and cover everything from charter transport, renting camping tent, guide service, cooking utensils, packed meals, pillow, sleeping bag, etc. The camper almost can come here without bringing anything (except some clothing to change, cash and personal toiletries). 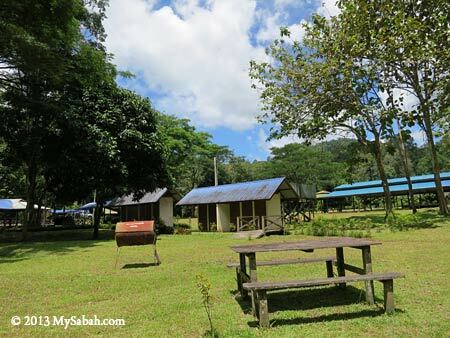 Do you know any other nice camping ground in Sabah? Please share with me. 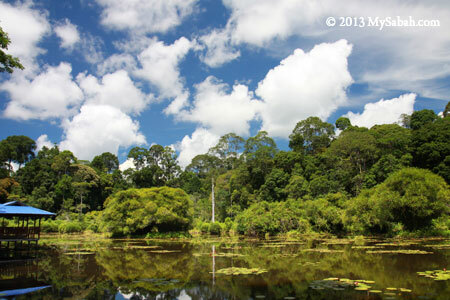 Whenever people talk about forest conservation, they would think that only the inland rainforest is worth protecting. Malaysian estate developers love to build condominium and resorts along seaside, as the sea view property is more marketable. 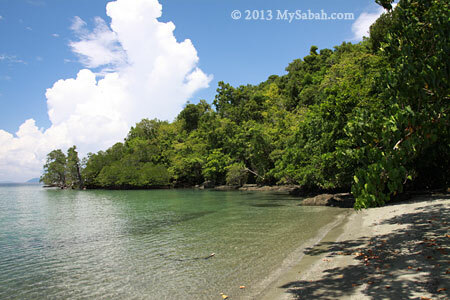 As a result, there are very few pristine “beach forest” (coastal forest) left in Sabah, and most of us don’t know that the coastal forest of Borneo is also an important part of our forest ecology matrix. 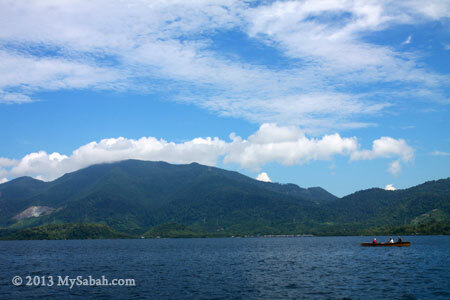 Pic: Tumunong Hallu is at the coast of Darvel Bay, far behind is Mt. Silam. 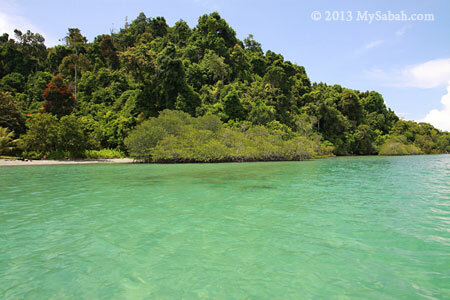 Tumunong Hallu Conservation Area, which is along the coast of Darvel Bay, Lahad Datu (see location map), is one of the best examples of Borneo coastal forest and the first coastal conservation area. 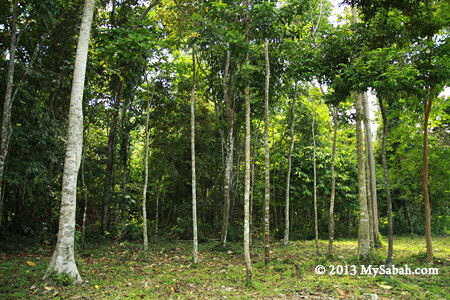 This 5.8-KM² fully protected forest is managed by Yayasan Sabah Foundation for research and education purposes. They consider opening the area for tourism too in future, as the beautiful beaches there are suitable for recreational activities. For now, it is a hidden treasure. 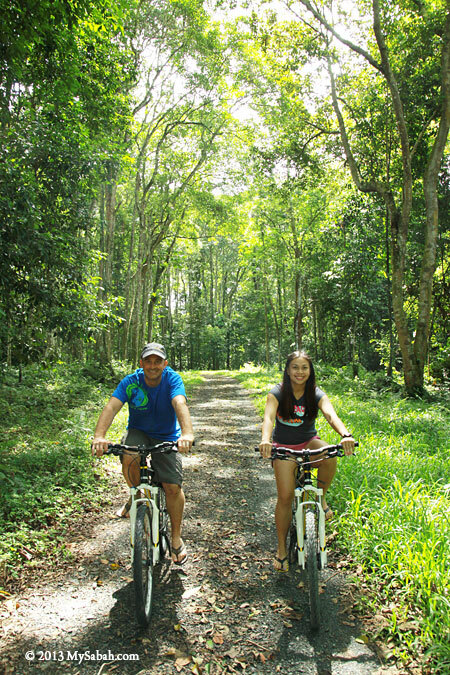 Thanks to Bike and Tours, I learnt about Tumunong Hallu last year. Tumunong Hallu is about 20 KM from Lahad Datu town and accessible by road, but we go by boat so we could cruise around the islands of Darvel Bay. 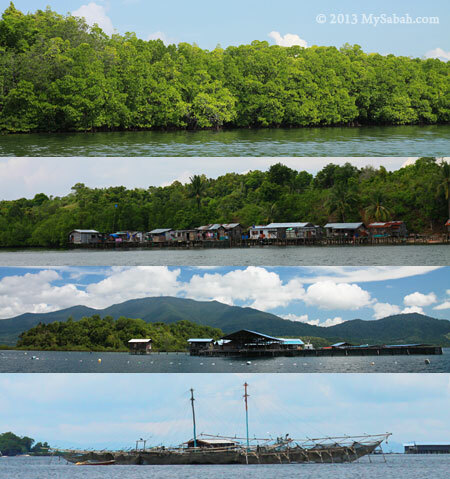 We saw mangrove forest, water villages, fish farms and fishing platform on the way. 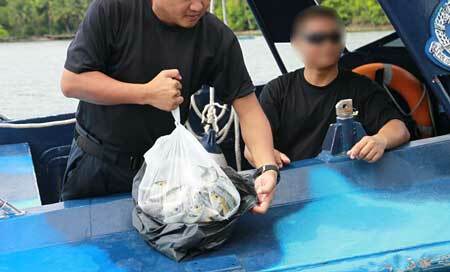 Then a marine police patrol approached our boat. I sweated a bit because I thought we entered the restricted area. 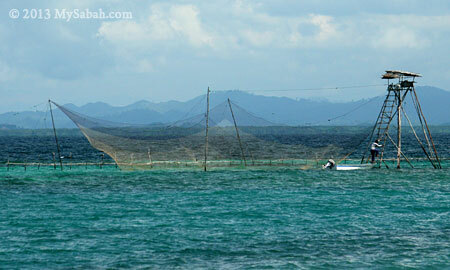 I also saw a lot of fishermen and fishing structure named Selambau (see photo below). Seem like everyone lives in Darvel Bay fish for a living. 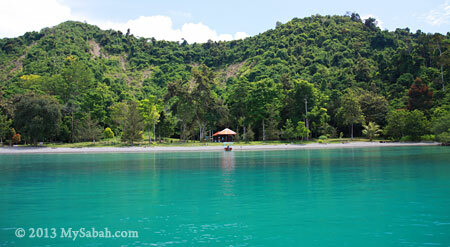 After an hour, we arrived the beach of Tumunong Hallu. 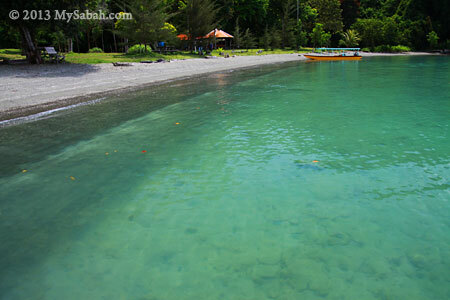 Pic: Tumunong Hallu and its beautiful sea water. 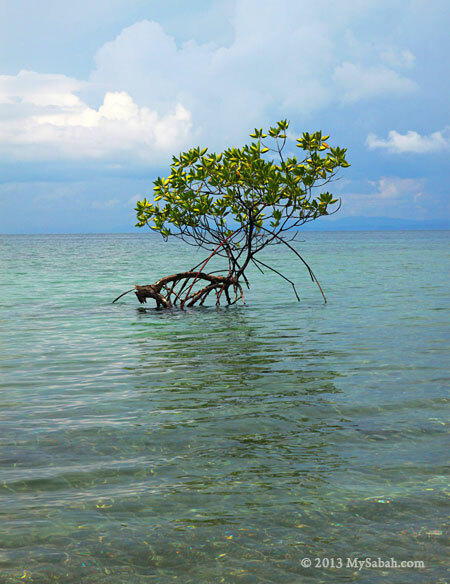 The seabed is rocky with layer of smooth silt, and the beach is covered by dark sand, all these are the characteristics of forested beach. 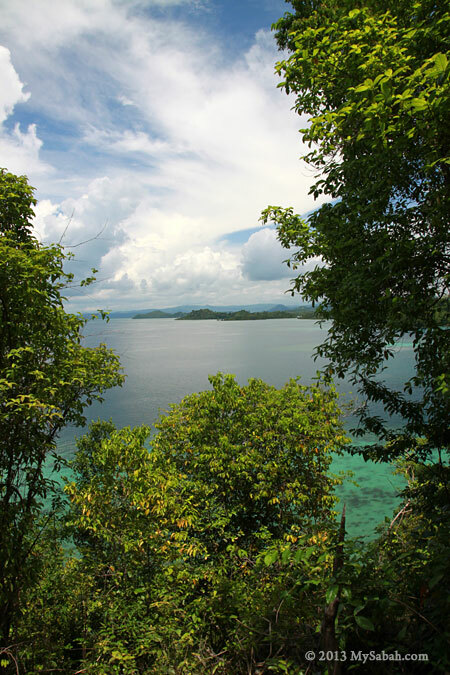 Besides the land, Tumunong Hallu also includes the sea area with rich marine biodiversity such as coral reef, and two nearby islands, i.e. 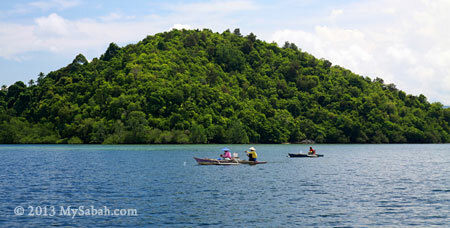 Saranga and Tabun Islands, into its 1,600-Hectare conservation area. 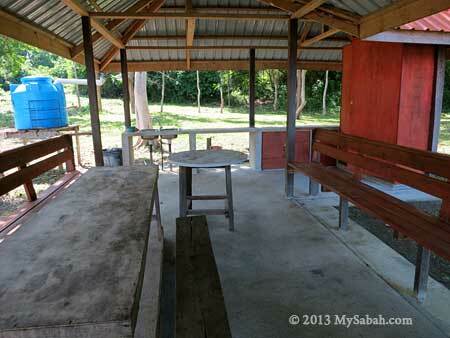 Pic: shelter and kitchen near the beach. This place is nice for camping too. 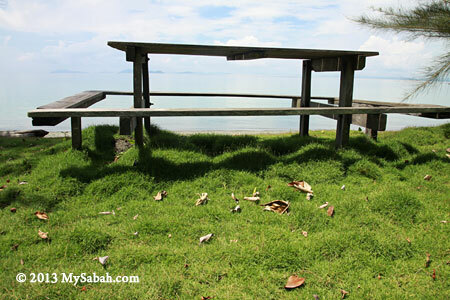 Pic: The shore is carpeted by lush Silam grass. 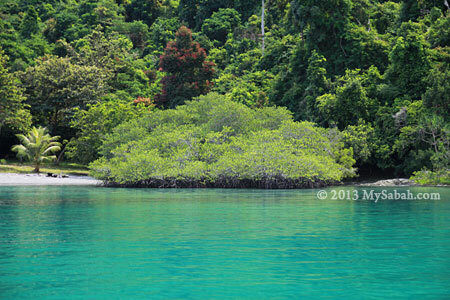 The researches show that Tumunong Hallu has 81 plant species comprising coastal and inland vegetation. 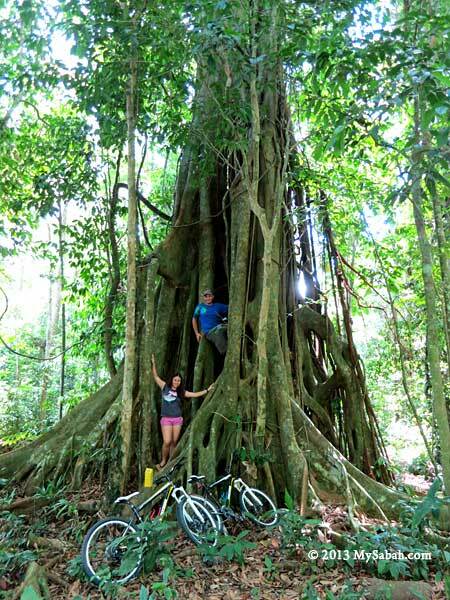 The best way to explore the interesting mixture of mangrove and dipterocarp forest here is by jungle trekking. We tried the shorter nature trail that is only 3 KM one way (then taking a boat back to starting point). 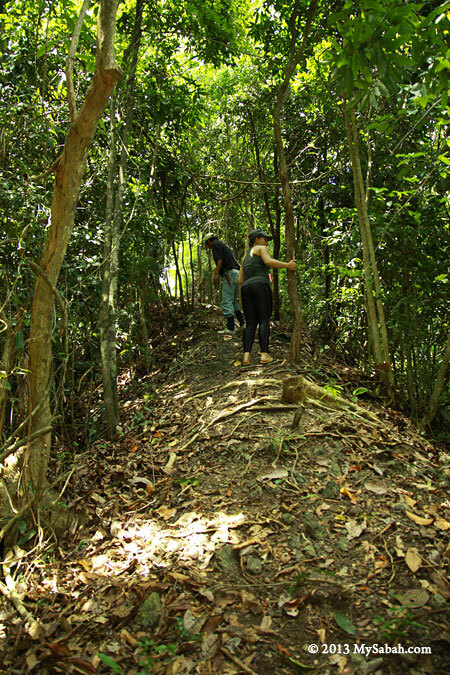 If you have more time, you can hike the longer trail to the hilltop, which takes 4 to 5 hours, to have a nice view of the beach and forest. Two forestry rangers, Yapdi and Azwan, were accompanying us and share some interesting facts about this forest. 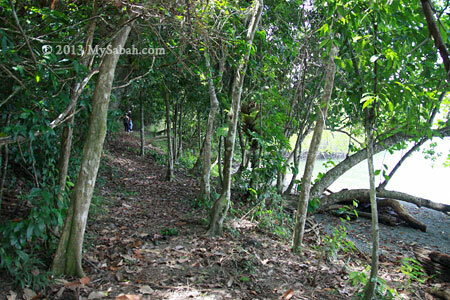 The trail is easy to walk and the jungle is not warm and humid as the rainforest, due to the sea breeze. 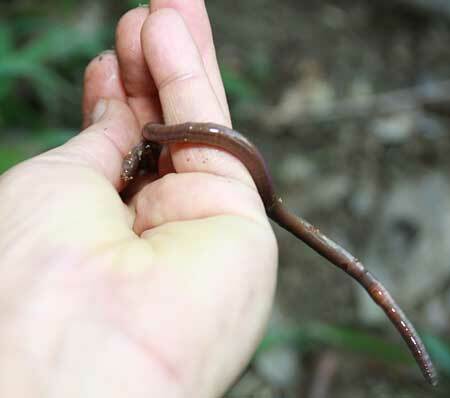 The soil here is quite fertile, evidenced by a big earthworm I found on forest floor. Pic: we took a short climb to Ara Viewpoint, which is a knoll near to a beach. There was strong scent of Kayu Malam tree in the air of this slope. This wood is a famous aphrodisiac among local ladies if I’m not mistaken. Pic: Nova cooling off on Ara Viewpoint. Note the dense Pandanus trees at her background. We also checked out the Nunuk Beach not far away. The coastal forest is not just a collection of dull trees. 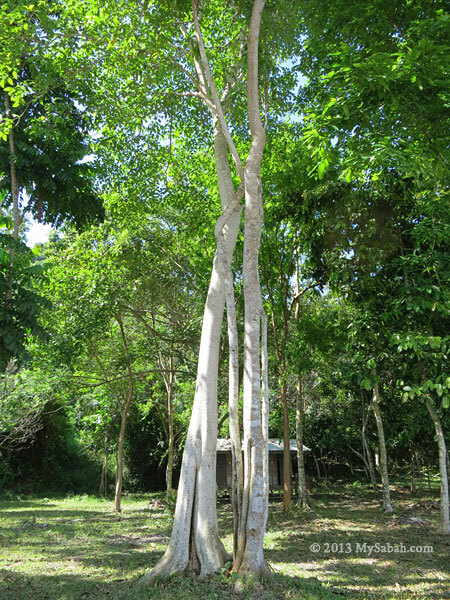 Among mangrove, seaside hill and beach forests, there are some interesting and unique trees, such as the Keruing tree below. 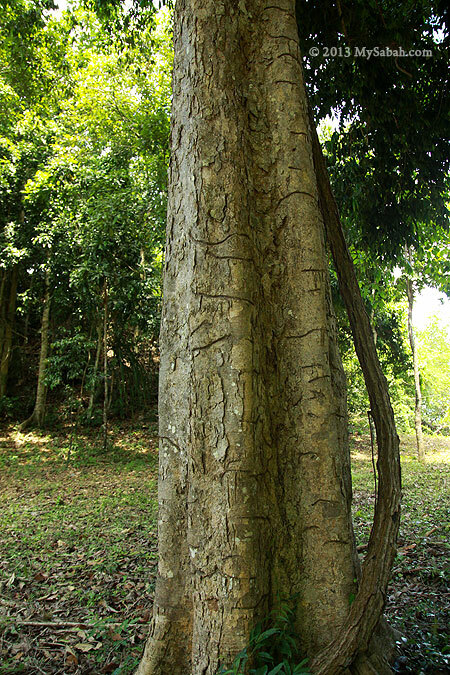 Pic: this Keruing tree looks like being vandalized. Actually the “cut” is a natural feature of its bark. 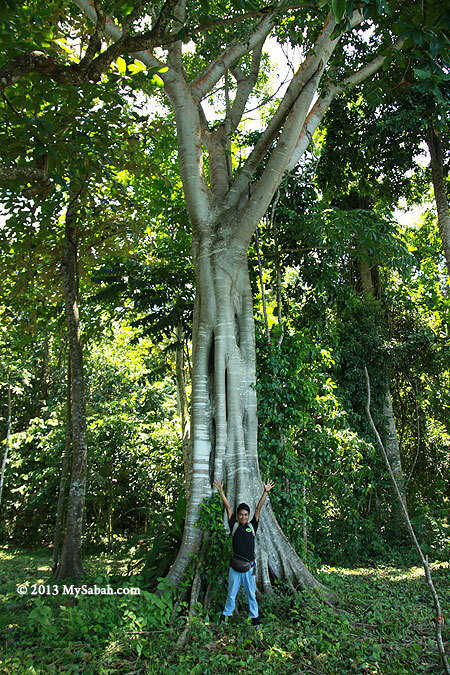 Pic: the tree in the coastal forest can be big and tall too, like the Nunuk Tree shown in photo above. 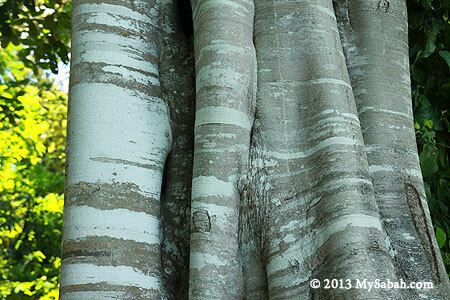 Pic: beautiful white stripes on the bark of Nunuk Tree. If there are trees, there must be wildlife. I didn’t see a lot of wildlife, but studies say some birds (e.g. 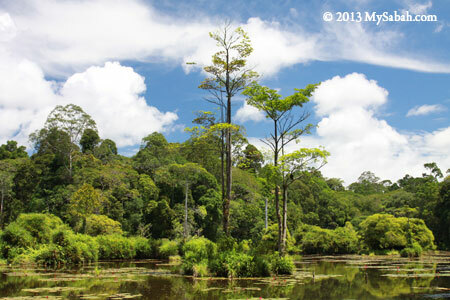 Great slaty woodpecker) and mammals (Long-tailed Macaque, Barking deer, Sambar deer) are the residents of this forest. We were hungry after one hour of hiking, so we took a boat back to the starting point for lunch. As this beach is not frequented by tourists, the facilities are basic but good enough for camping. There is no resort, restaurant and shop here. 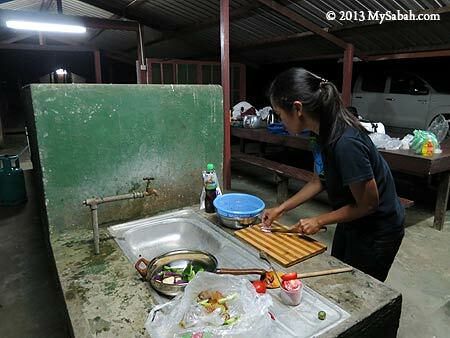 If you want to cook, you have to bring your own cooking utensils and gas stove. 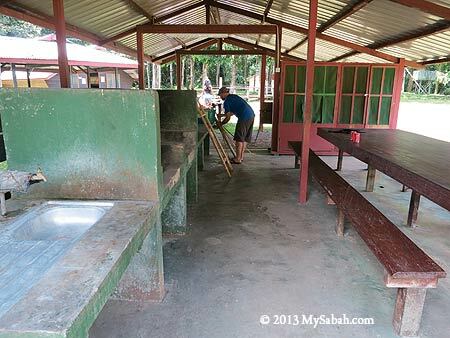 Pic: small kitchen with sink and water supply, benches and table for dining. Pic: enjoying lunch with Nova, my partner in crime, and Simon from Bike and Tours. Don’t know why. Food always tastes great at seaside. 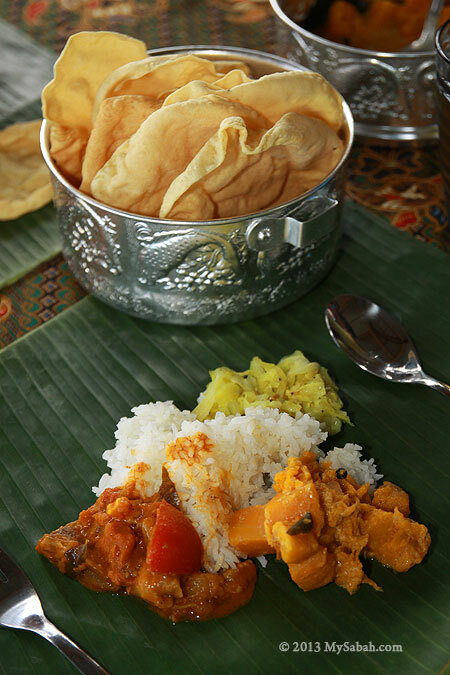 Pic: Yummy Indian food prepared by Tisha and Simon from Bike and Tours, the curry and sour vegetables were so appetizing… They really know how to cook and present the food. 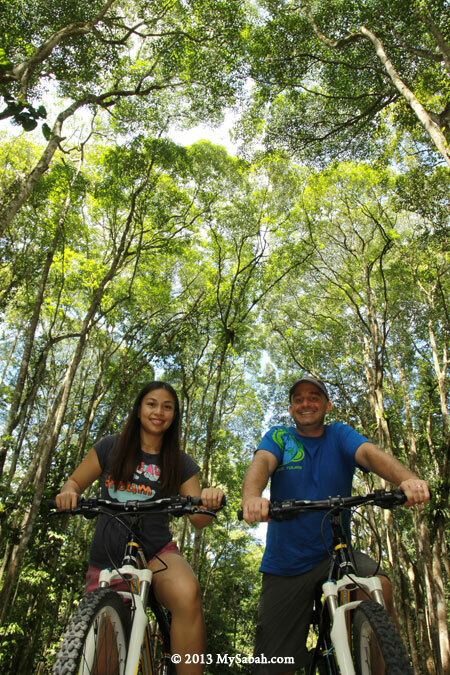 This friendly couple receives a lot of positive feedbacks at TripAdvisor. Hey, we were at the beach so we must soak ourselves in warm tropical sea water to conclude the tour. The whole beach was ours to enjoy. 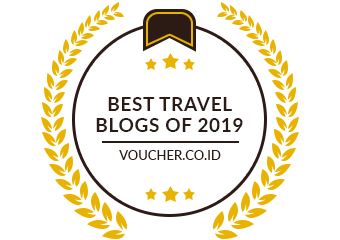 Overall, it’s a wonderful experience. Even though Tumunong Hallu is not a popular destination now, being unfamous doesn’t mean that it has no potential. If it is open to public in future, you must visit this place. 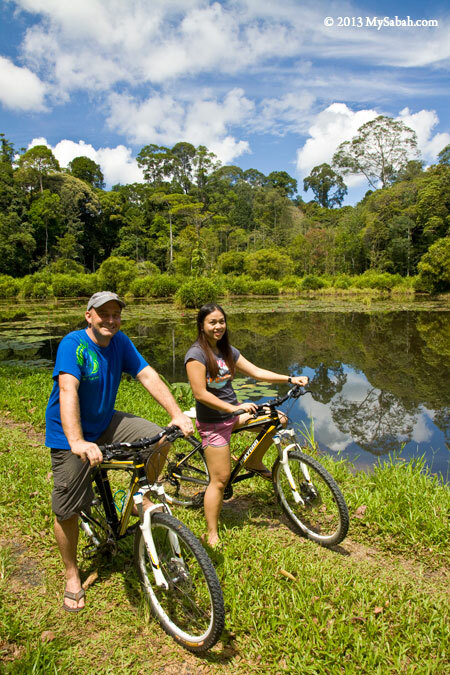 At the moment, you can arrange a tour with Bike and Tours for a trip to Tumunong Hallu.